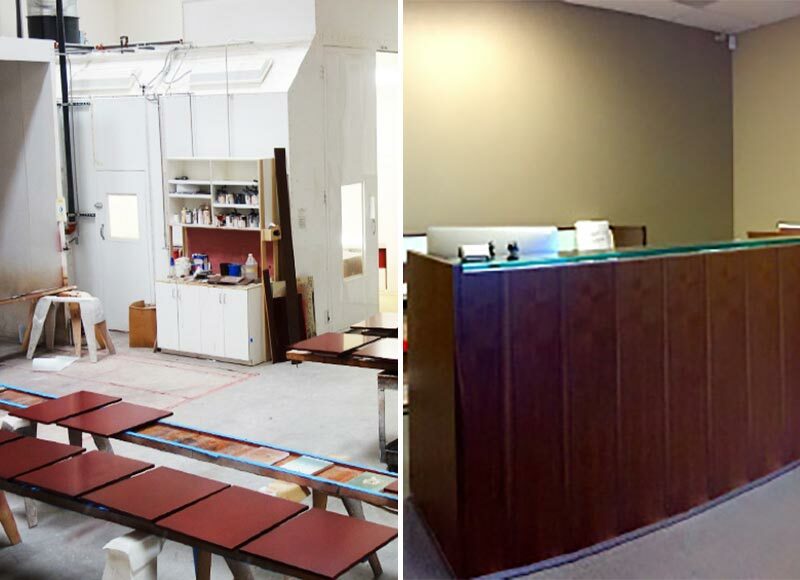 C T Finishing offers exceptional wood refinishing, restoration, specialty painting, and repair services to millwork manufacturers, architects, commercial contractors, professional remodelers, and builders throughout Orange County, Los Angeles, and San Diego. We are a commercial wood refinishing company with over 25 years of experience, and have earned an excellent reputation for precision craftsmanship, impeccable attention to detail, and honest business practices. Our highly-skilled team can refinish, restore, and revitalize a wide variety of interior surfaces, including fine woods, laminate, metal, marble, and granite. At our state-of-the-art industrial workshop in Pomona, California, C T Finishing is fully-equipped to complete a wide range of wood finishing and refinishing services, from initial prepping, sanding, and repair, to specialty painting and final applications of sealers and topcoats. Our services are most often used to finish wood cabinets, counters, wall panels, crown molding, wainscoting, staircase materials, and display cases for millworkers. To ensure a smooth and flawless finish for every project, we use professional spray painting techniques in our in-house paint booths that cannot be matched through traditional brushes or rollers. In addition, we are recognized in the industry for our ability to achieve precise custom color matches for a broad range of wood and metal coatings. Our knowledge of paints, stains, lacquers, varnishes, and polyurethane coatings allows us to refinish and restore surfaces to your exact specifications. We also often work with clients to create new or unique treatments specifically for their projects, including antiquing, marbleizing, glazing, crackle-finishing, and gold/silver leafing. Contact us today to schedule a no-fee consultation with one of our experienced team members. They can explain our full range of in-house services, and advise you on the best refinishing options for your project. We welcome projects of all sizes from clients throughout the United States, and can arrange for shipping to and from your project location.